Advance Lifts 1000 Series Dock Lift:. • Axle Capacity Bridge End: 2,000 lbs. 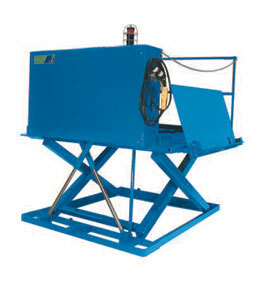 • Axle Capacity Ramp End: 2,000 lbs. • Platform Size: 6 x 6 ft.
• Overall Size: 76 x 92 in. • Lowered Height: 5.25 in. • Bridge Size: 18 x 60 in. • Chock/Ramp Size: 30 x 60 in. • Shipping Weight: 2,400 lbs. • All models are equipped with a hinged bridge with a pull back chain. • The controllers are assembled in our U.L. approved panel shop. • All pressure hoses are double wire braid with JIC fittings. • Reservoirs are mild steel.